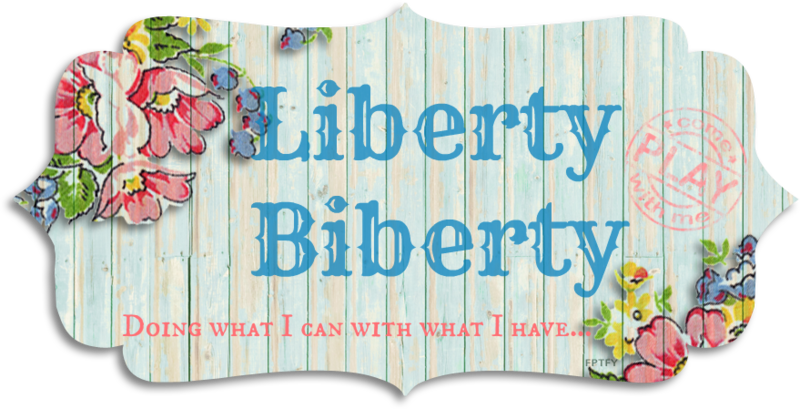 Liberty Biberty: The Little Shabby Craft Shed! 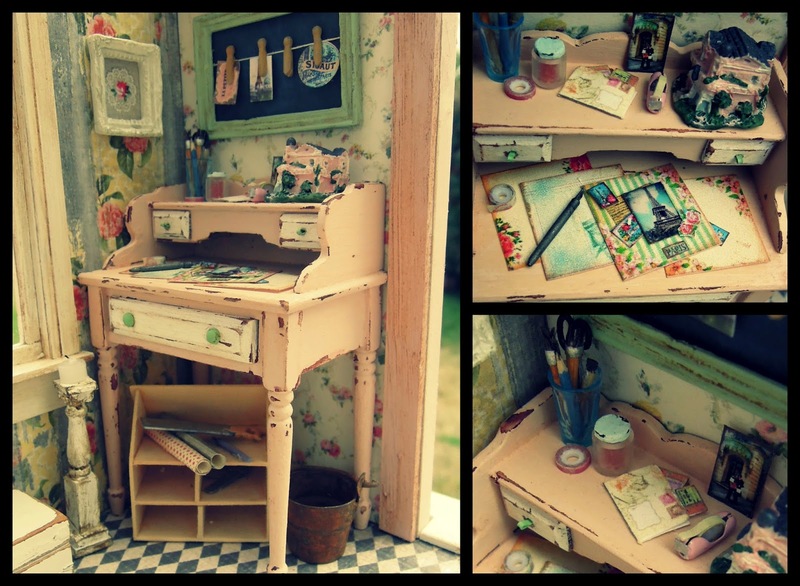 The Little Shabby Craft Shed! 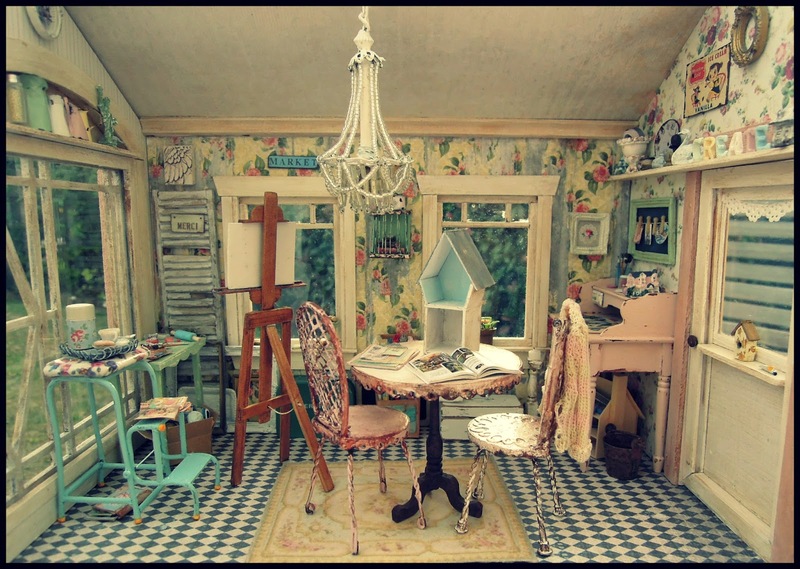 and it's a little craft studio! 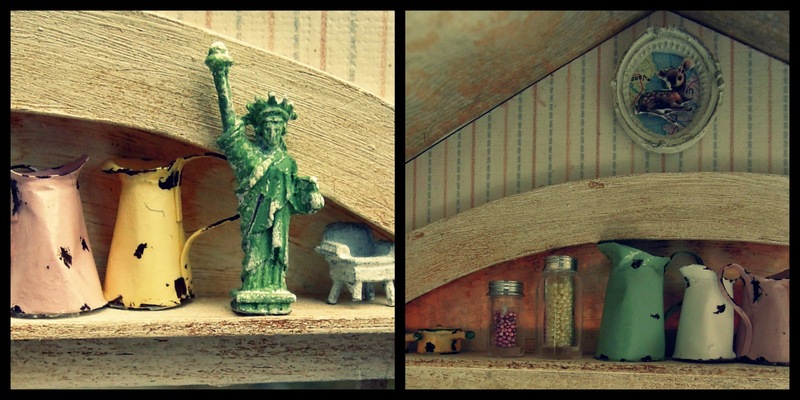 I've filled it with crafts representing many of the things I love to do. and a few special little treasures from my friends. 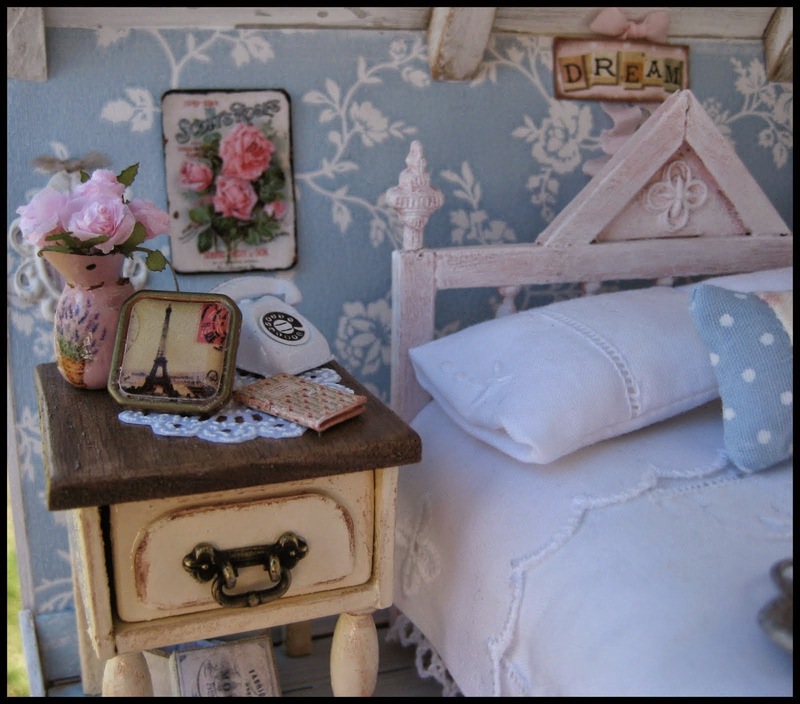 There just had to be a teeny tiny shabby cottage in there! Cardigan a gift from Frederica. Making a vintage sheet music wreath. 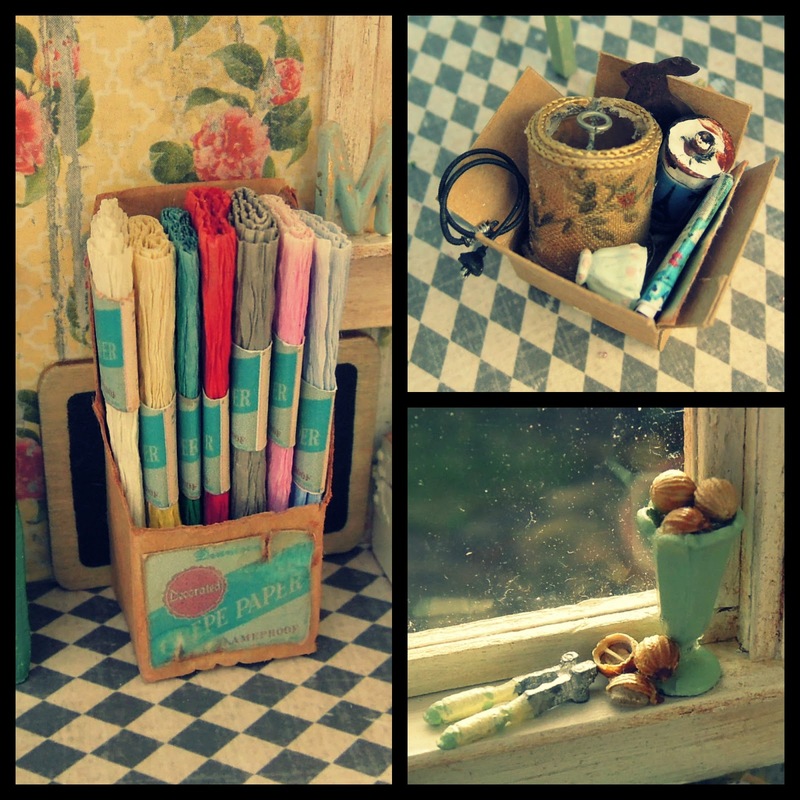 A cupboard overflowing with craft 'stuff'. 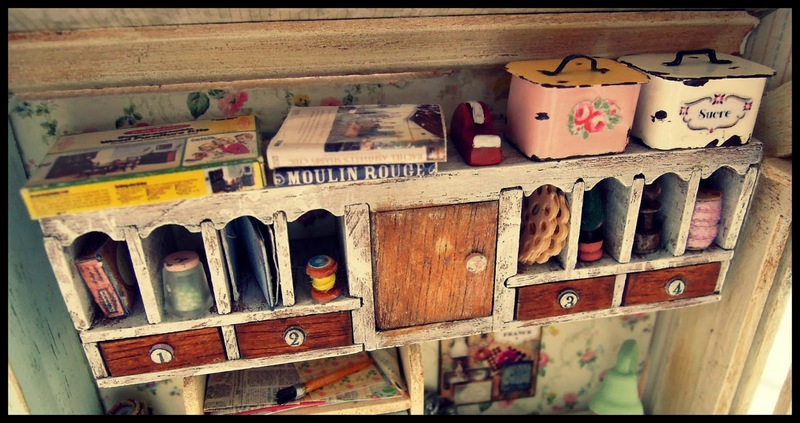 I think most crafters have at least one of these in their house! Little oil painting done by my mother! The scene is a beach we used to go to when I was little. Tiny polymer clay creations in the making. My Bernina sewing machine is in a case like this and it's almost as old as I am! 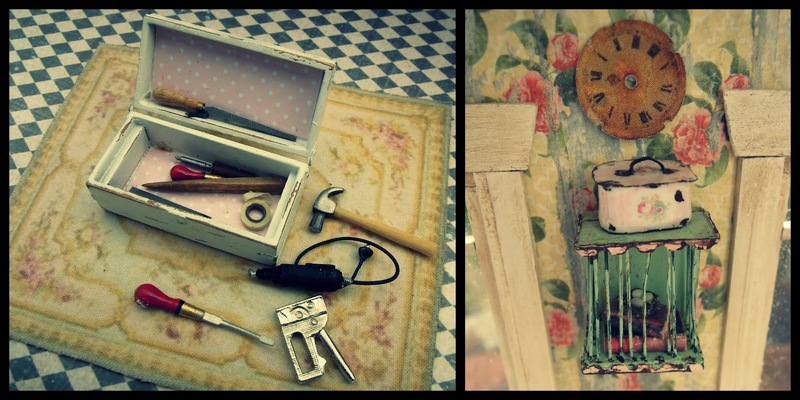 Beautiful shabby toolbox and fabulous tools a gift from Kim. 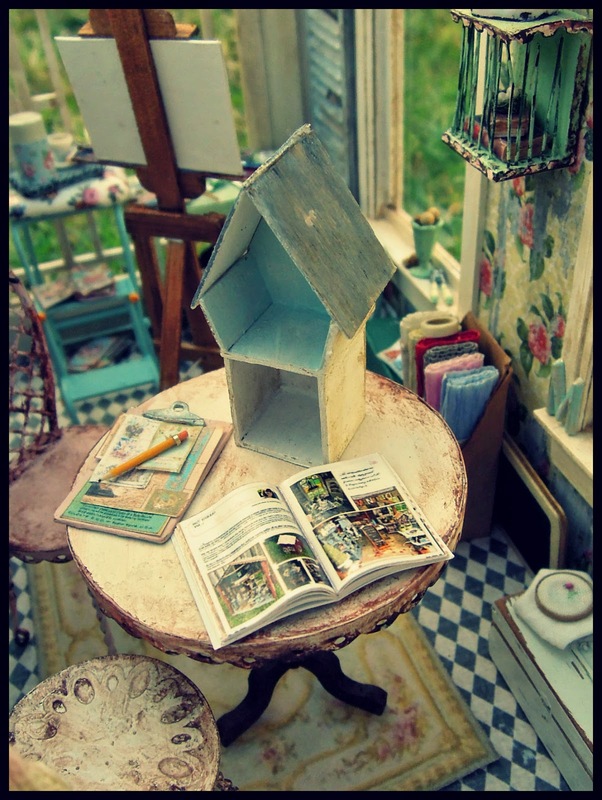 I think the tiny birdcage with old books and a nest inside and the tiny vintage tin on top might be my favourite thing I've made! 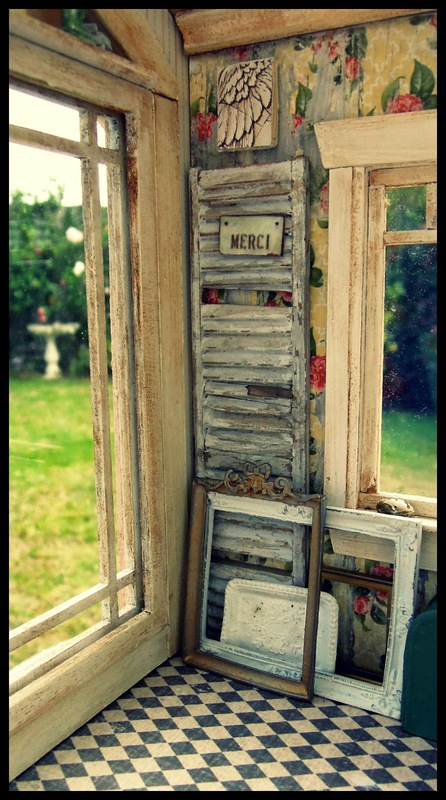 As usual there are things in here I'd love to have in my real house like an old shutter. Coffee and cookie made by Kim. 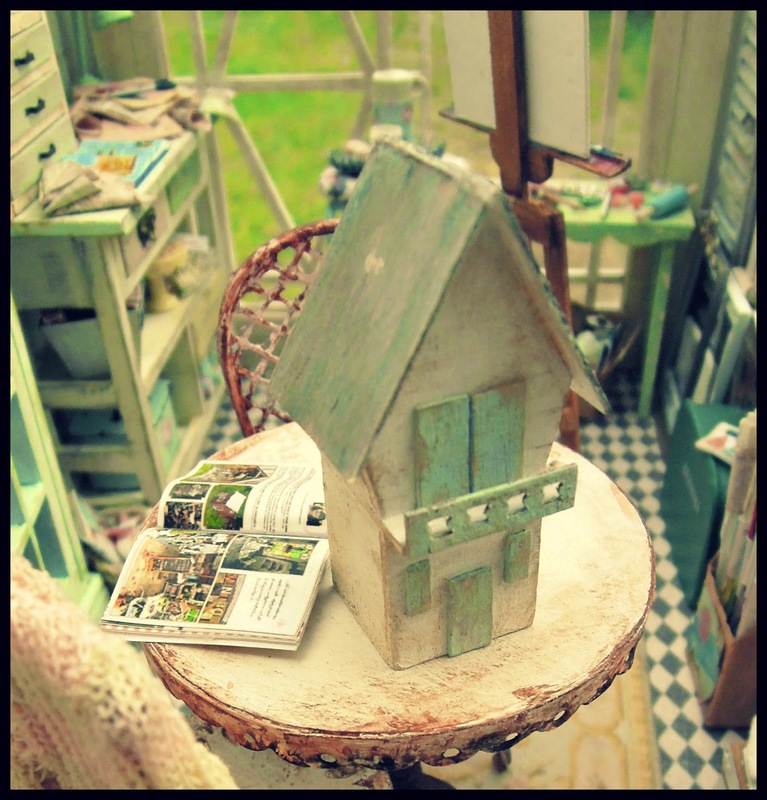 Tiny copy of Mini-ologie magazine (featuring my barn!) made by Lori Turner-Dolinsek. I was lucky enough to meet Lori went I was in America and she sent me the magazine when I got home. 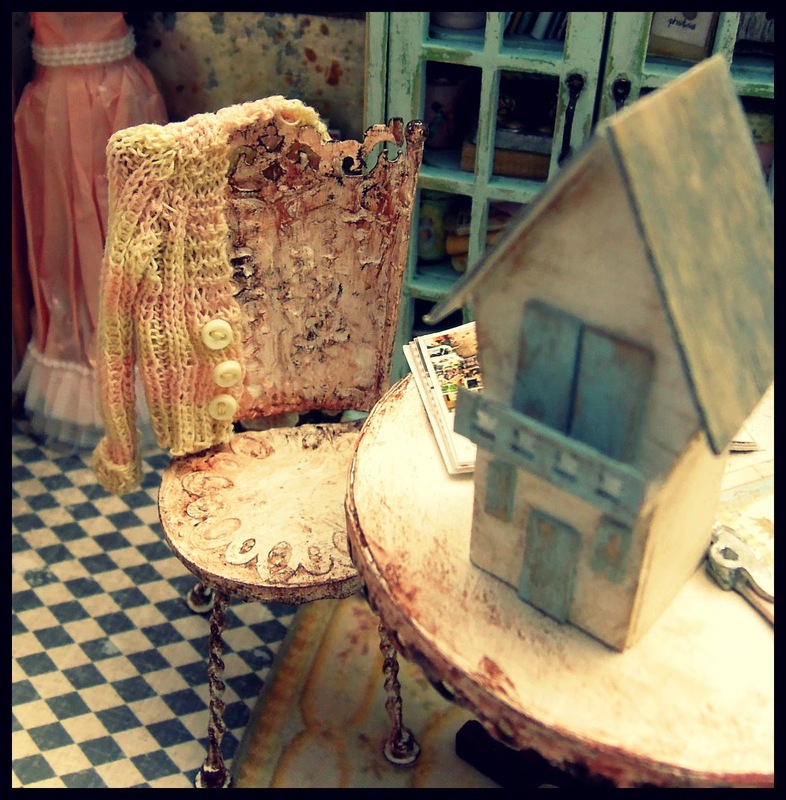 I hope you've enjoyed that little tour around the shabby craft shed! It's kind of 1:12 scale or maybe a little bit smaller, I'll try to do another post soon showing the scale of some of the very tiny things in there. How wonderful! It makes me dream, what you achieved is really fantastic and gorgeous. Oh my goodness. 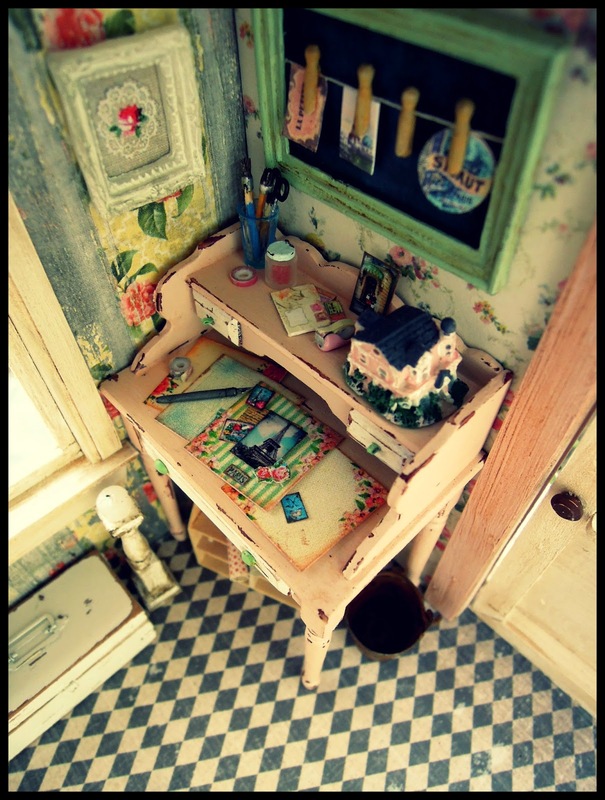 I have a craft room in my dollhouse and you've inspired me! You are so amazingly talented. Thank you, thank you! Es absolutamente adorable!! Me gustan todos los detalles y los colores utilizados. Precioso. Where to begin? Oh my goodness, what an absolutely enthralling creation!! The attention to detail is unbelievable. 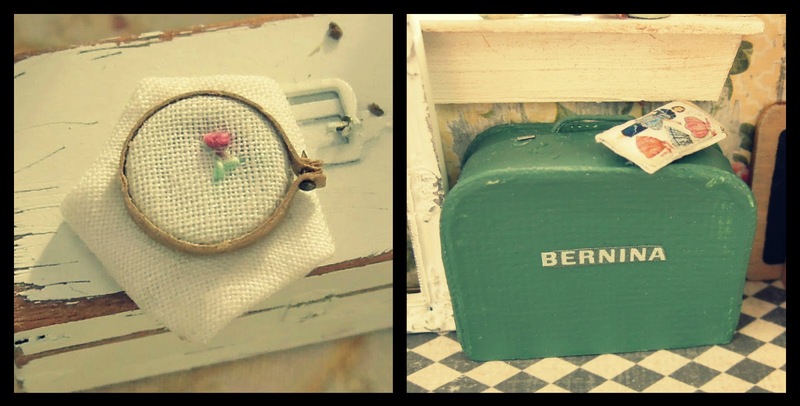 The little teeny paint tubes & the little rose embroidery in an embroidery hoop! 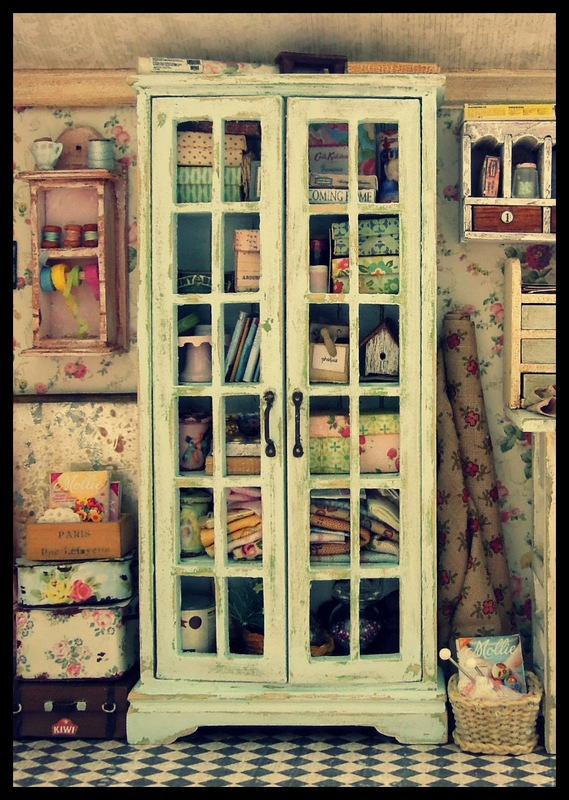 Then there's that wonderful cabinet crammed delightfully full of fabric, books & boxes. Nice little touch w' the sweater draped around a chair back. And what a treasure to have that precious painting that your mother created. Too much to mention. I could go on & on. Suffice it to say that I was delighted w' your creation. 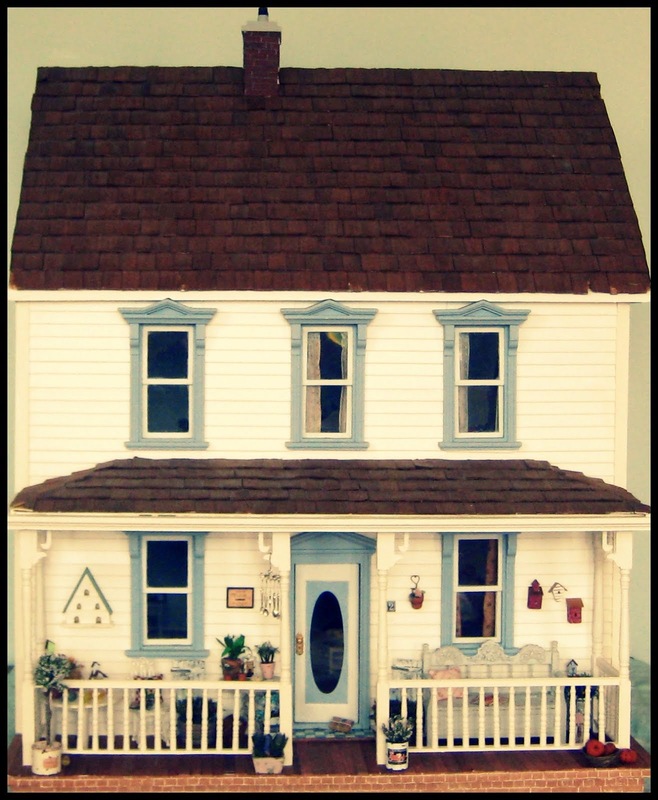 That piece would be a huge hit at our annual Seattle Dollhouse Miniature Show!! Thank you so much for sharing. Your great big mini fan, Debbie. 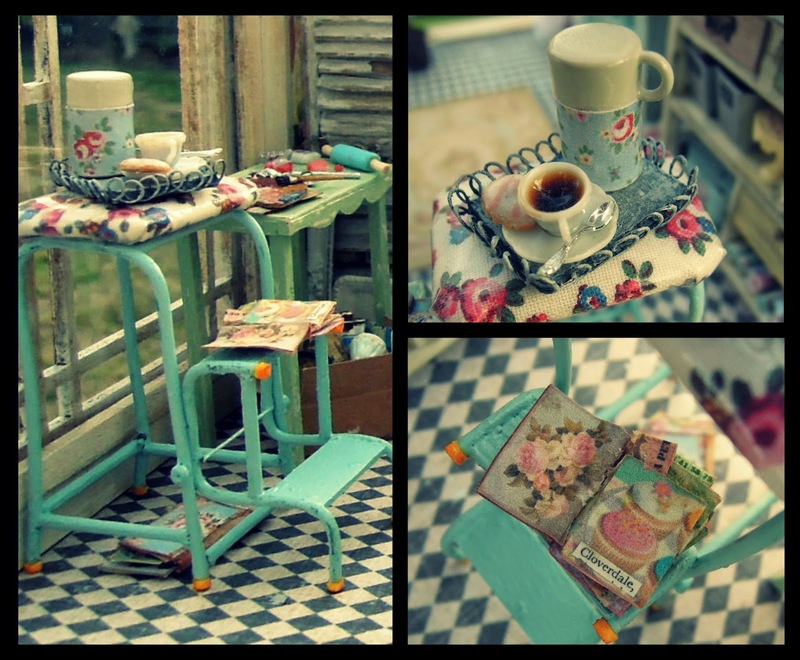 This is absolutely delightful...and perhaps the most beautiful mini creation I have ever seen. 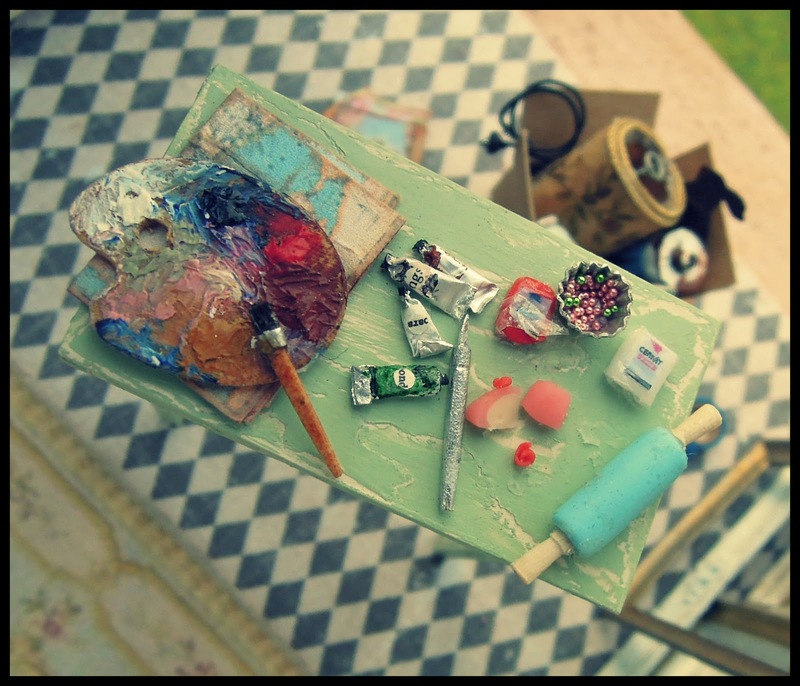 I love seeing all of your hobbies in miniature. Your attention to detail is fantastic! 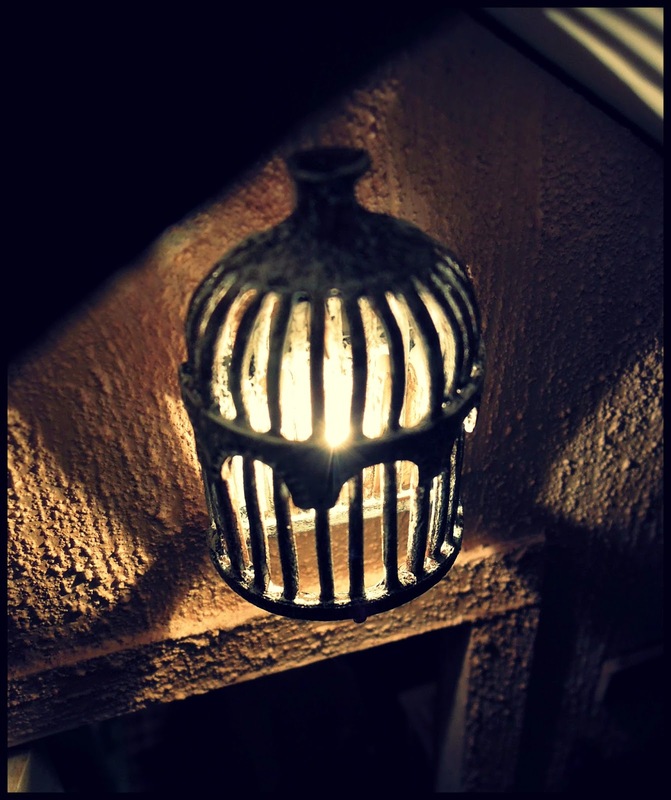 Thank you for sharing -- so nice that you are willing to let all of us have a little look inside. Beautiful! And very detailed. I like. Absolutely gorgeous, Mercedes! So many items and details... 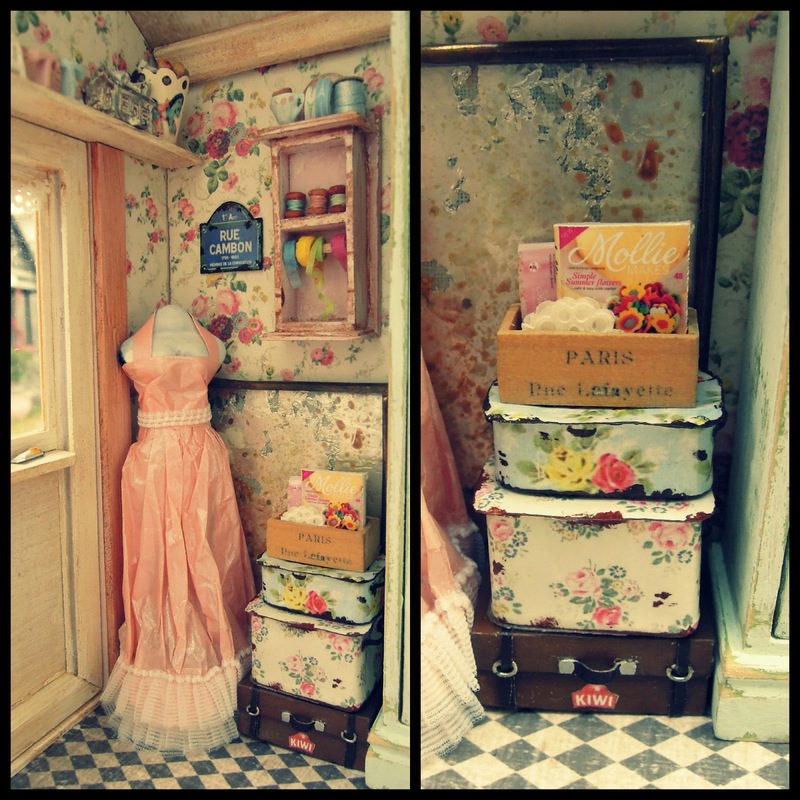 It is a dream of craft room. And de colors... beautiful! Thanks for sharing. I am a fan of your work!!! 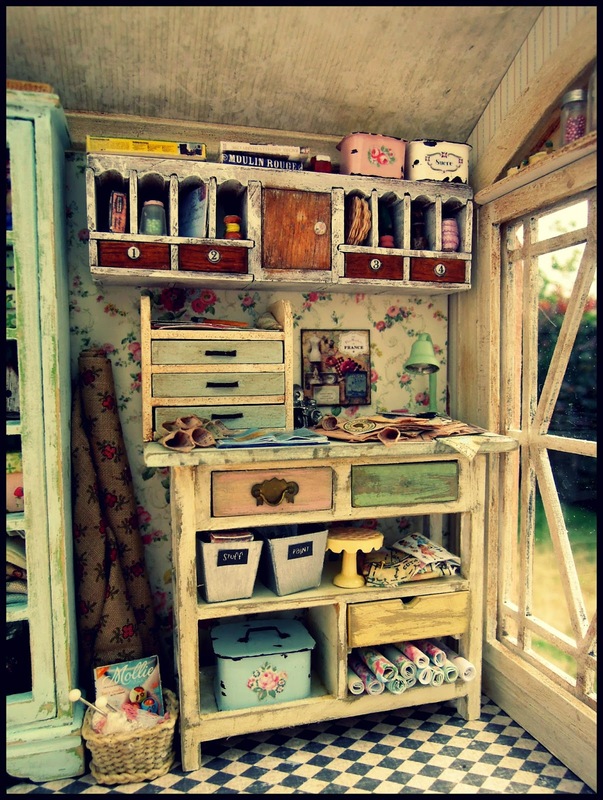 A very nice craft room and the details are so lovely. This sightseeing is a joy. 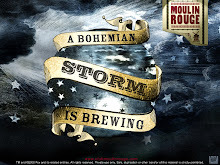 What a wonderful and inspiring project. 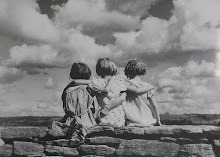 Great pictures too. Keep up the good work - thank you for sharing this with us. It's so sweet Mercedes! 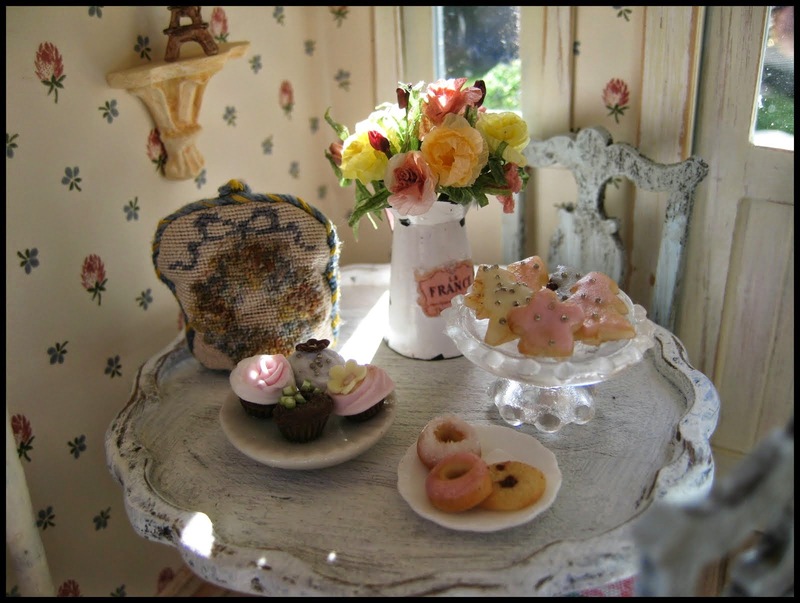 It is just like a real craft room - all the favourite things, the pretty things, a bit of disorder and everything most loved. WOW! 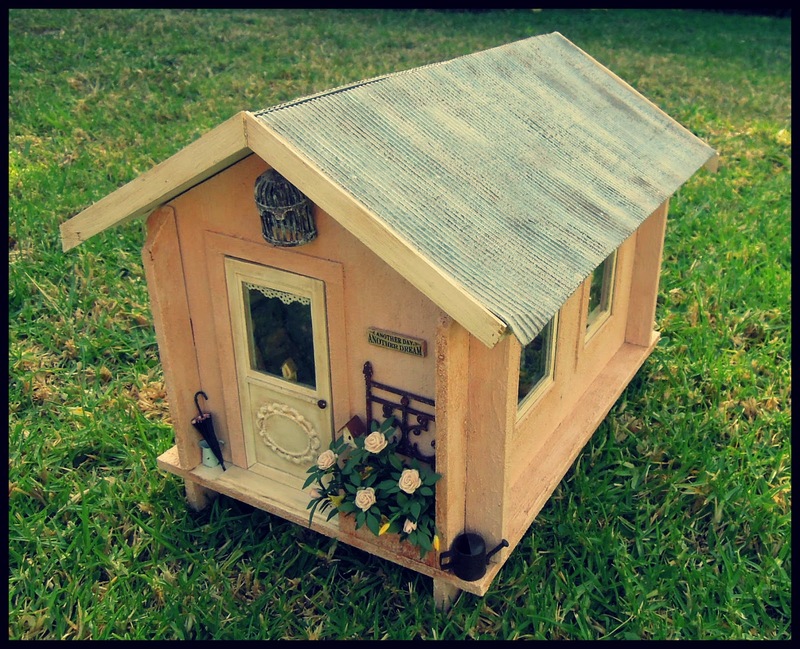 You have filled that little shed with so many tiny awesome treasures!!! 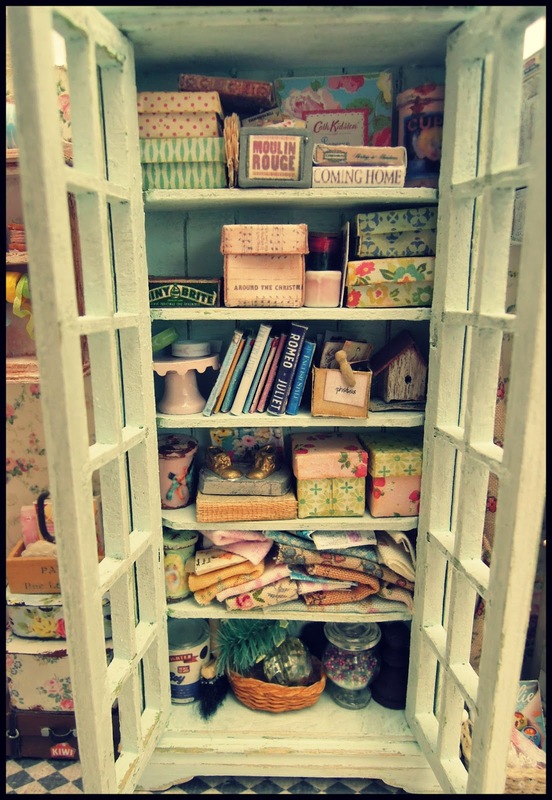 Wouldn't we all love to be able to spend hours in there...! You have left nothing out! I especially love the cardboard boxes full of extra stuff! LOL! That is so realistic... even in a well put together place we have "stuff" we don't know what to do with but can't throw away! All your details are so amazing.... I could spend hours looking at everything! You are Amazing!!! 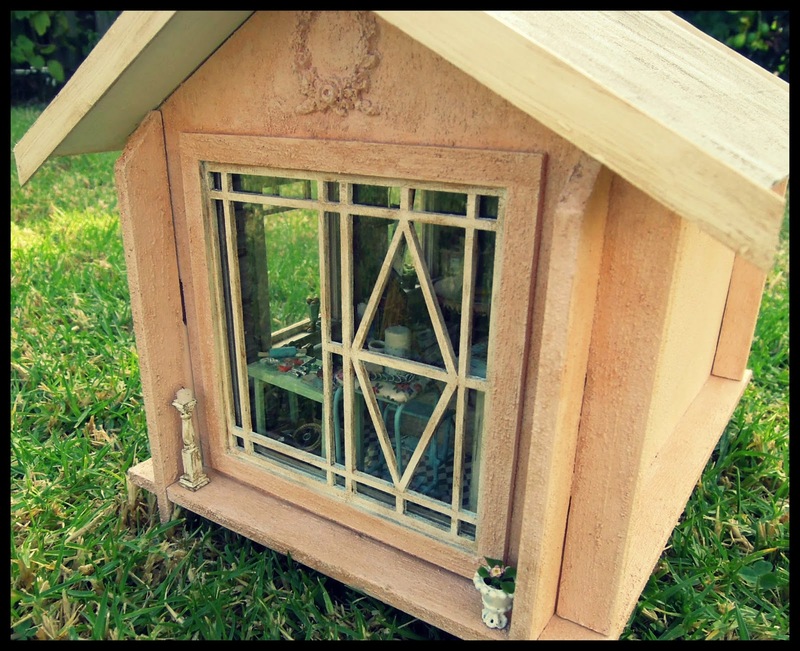 What a great little project! 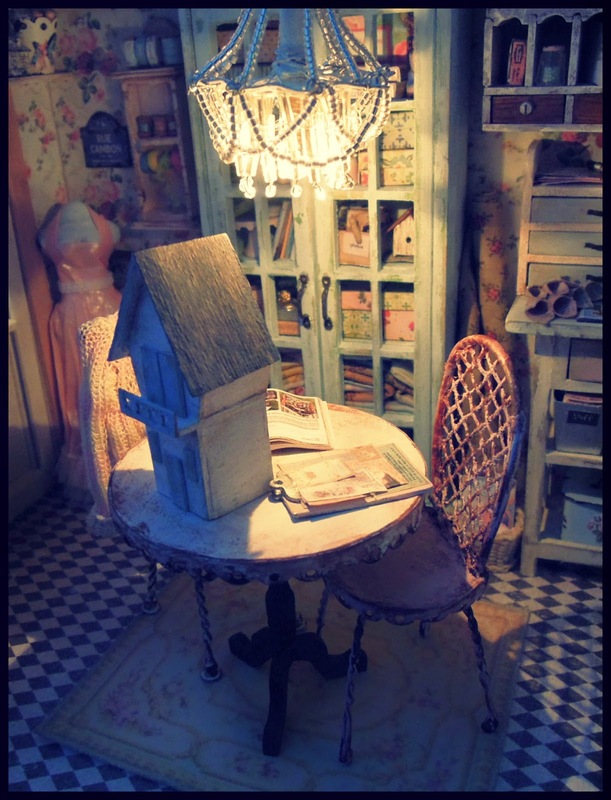 Fabulous craft shed and fabulous photos. I love all the wonderful details and accessories. 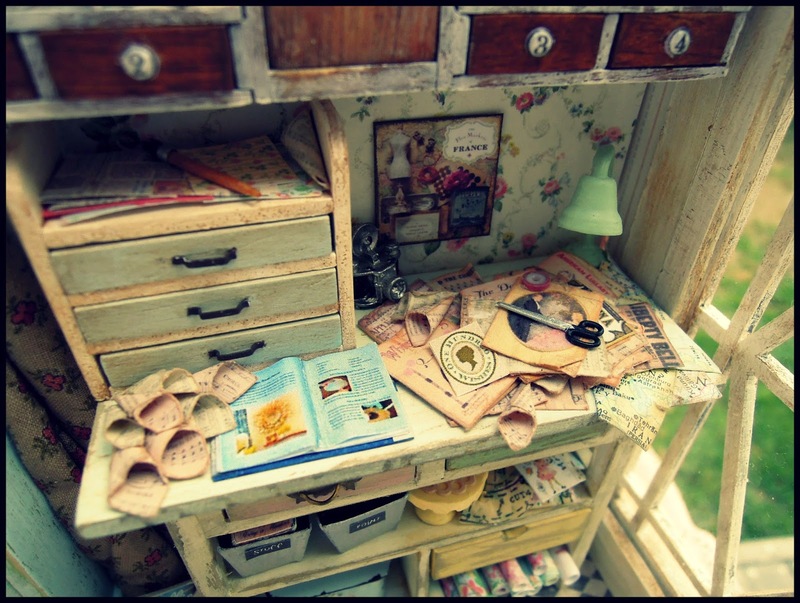 I wish my craft room looked like that. I'd never want to leave. 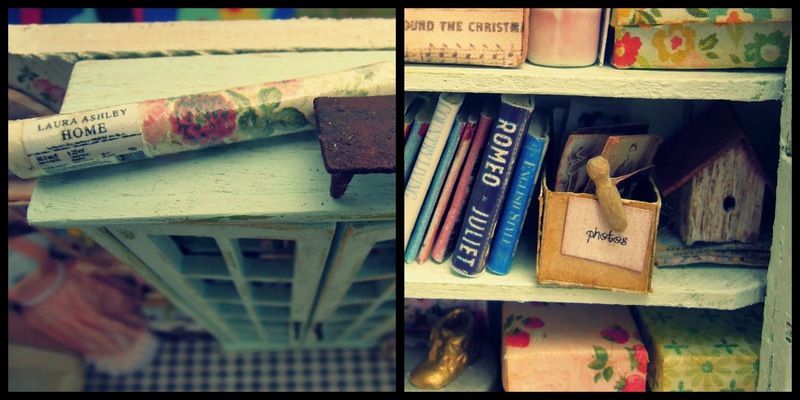 The Mollie Makes magazines, Romeo & Juliet and that clipboard. You've done a spectacular scene, every exquisite detail fits perfectly in the assigned place, combination of colors is beautiful, looks like a space really lived. Great job Mercedes, congratulations. What a fascinating room you have created! I absolutely cannot get enough of looking at all the fine little details. I will be back again and again as there are so many things to see. I love your work. 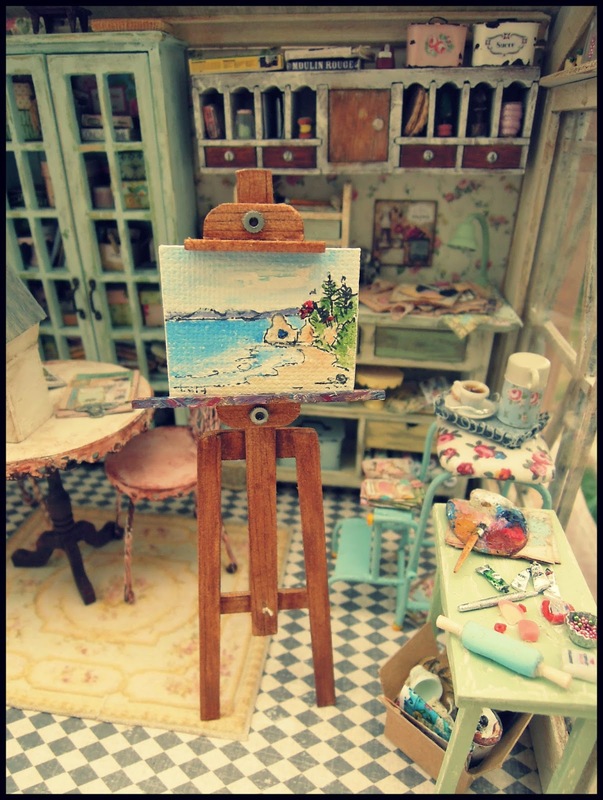 You are one of my favourite miniaturists! Hi Mercedes! THIS ROOM ROCKS! A Really Stunning Achievement Mercedes and I am so glad that you have shared it with us! Wow! It looks so real, I had to look several time at the first picture. 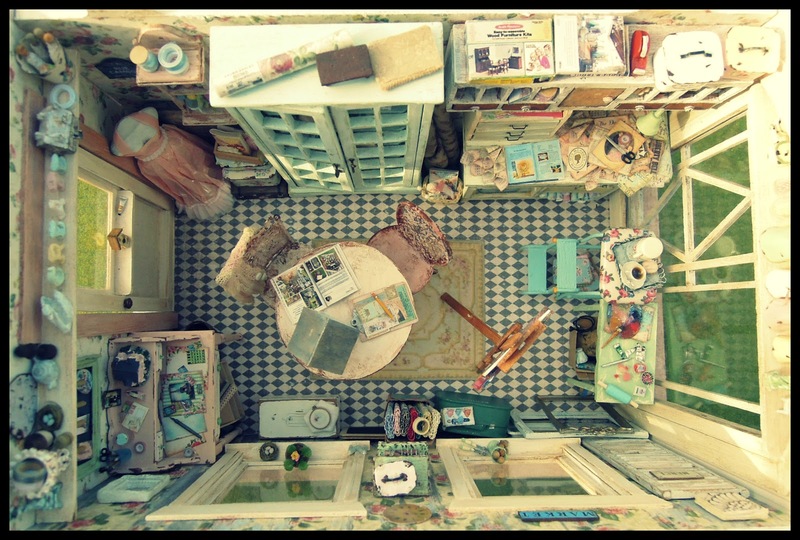 I want a room like that in real life :) Lovely colors and so many details to look at. Como me gusta esta escena!!!! 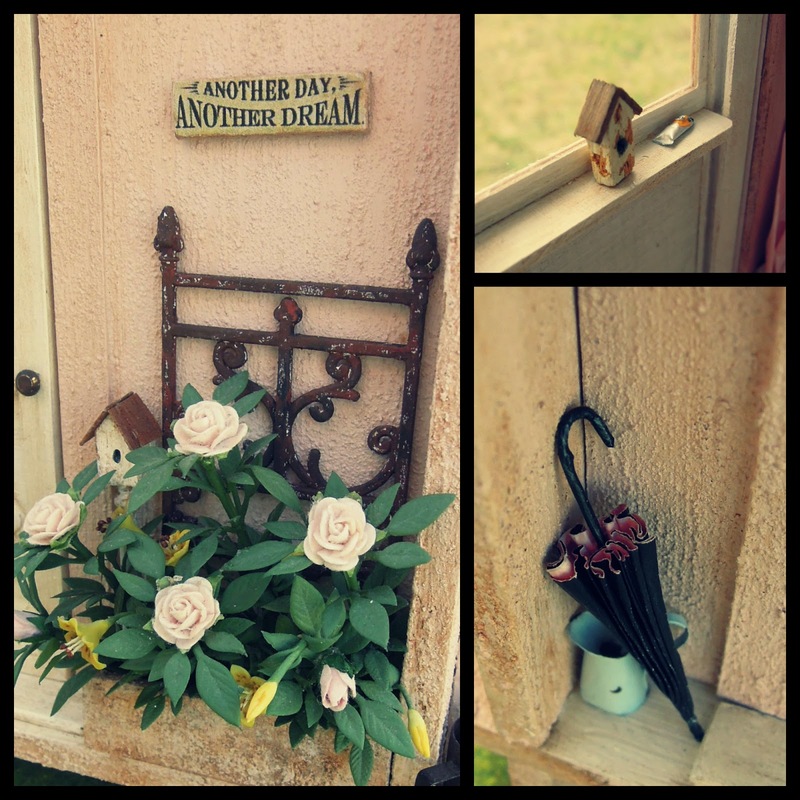 es genial perderse en todos su rincones y detalles. Awesome, as usual. Beautiful colours total eye candy!! Thank you for sharing and giving me some down time simply staring at your creations. 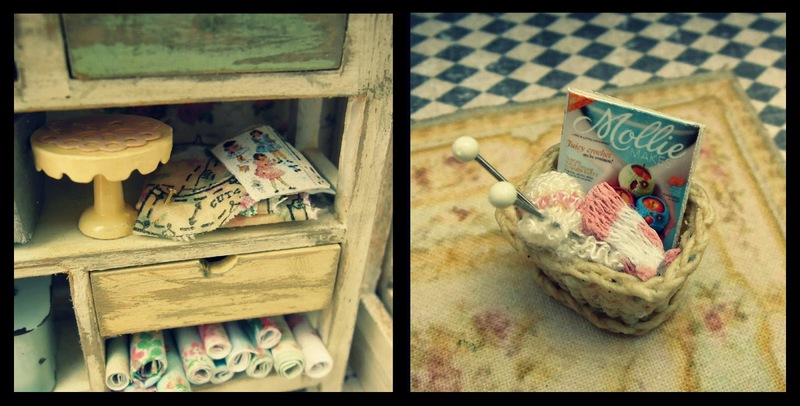 Many thanks for sharing your little craft room. It is full of charm and wondrous things. PS Had an amazing visit to NZ . Scenery fantastic and locals so kind and full of fun. Impresionante,una verdadera maravilla!!! La habitación que muchas desearíamos tener,llena de pequeños tesoros,materiales,"trastos encantadores"....y todo con unos colores preciosos,me gusta toda entera!!! 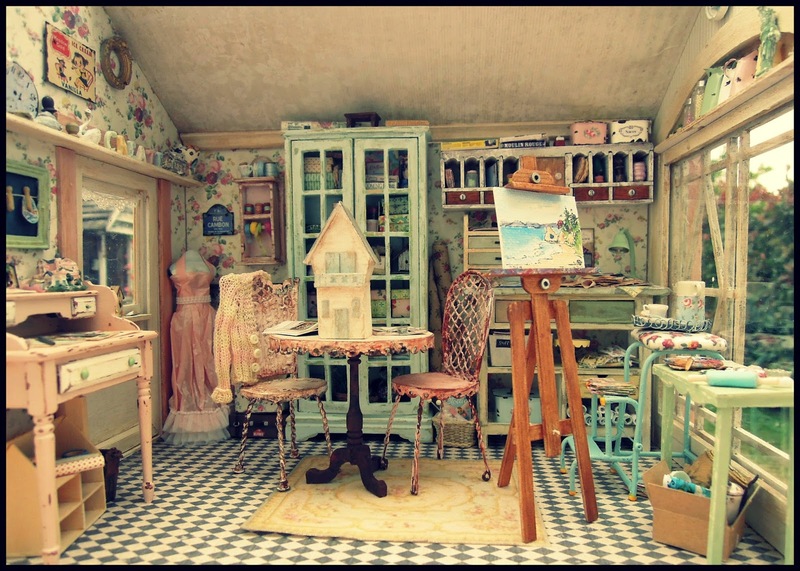 I am the Editor for American Miniaturist Magazine and was wondering if you would like to have your Shabby Shed featured in American Miniaturist Magazine. 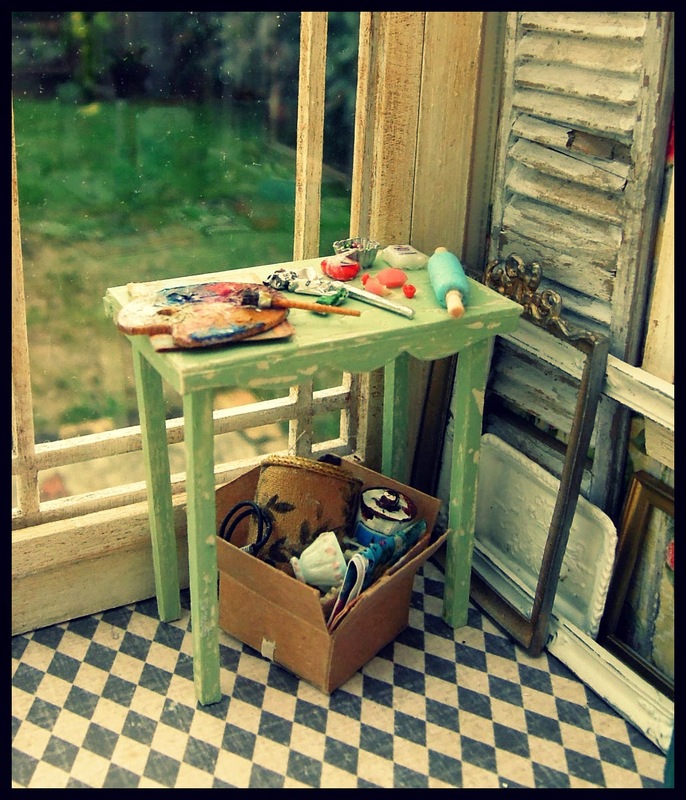 I particularly love this shed because I am a mixed media collage artist as well as a miniature hobbyist. Wonderful the way it feels like a peaceful place to create. 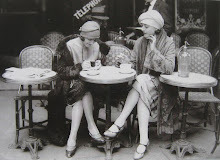 I would love to share this wonderful piece with our readers if you would be interested. 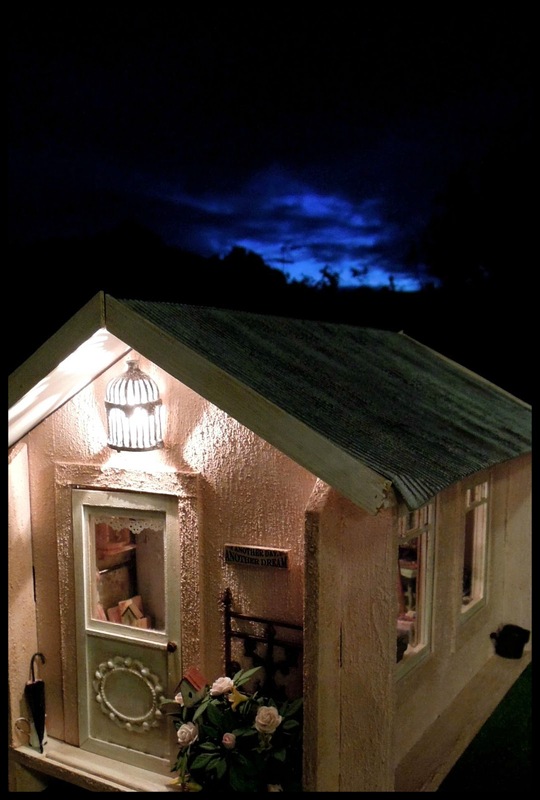 It's a great way to reach many people who have a passion for miniatures. You can email me at auralea@ashdown.co.uk if you are interested. Spectacular work as usual, Mercedes!! 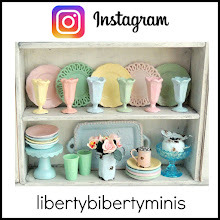 Thanks for sharing with us.....it all looks just wonderful and it is inspiring to see the lovely little miniatures you have made! 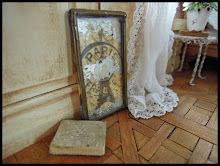 I was looking for inspiration for props and scenes for a project and I stumbled accross you wonderful blog that I hadn't visited for ages!!!! 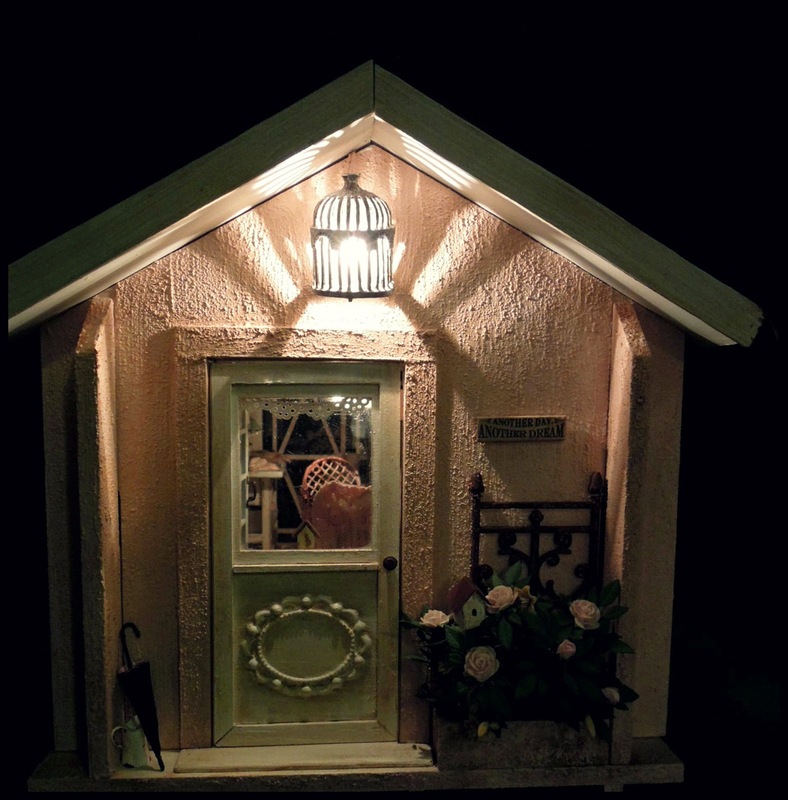 This shed is absolutely stunning and gave me an idea. You are so so so clever! Love it! Send a big hug to Liberty for me. 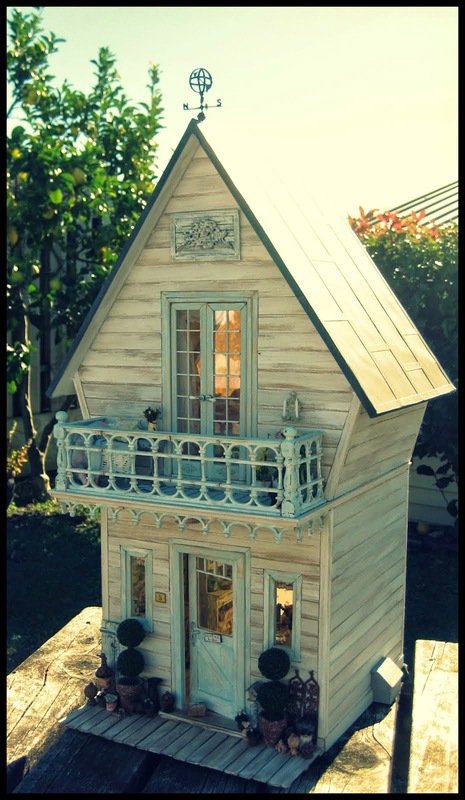 I am just speechless, this craft shed is amazing, such attention to detail, it is lovely, really lovely, such work involved, brilliant. I absolutely love this shed inside and out! Just lovely! 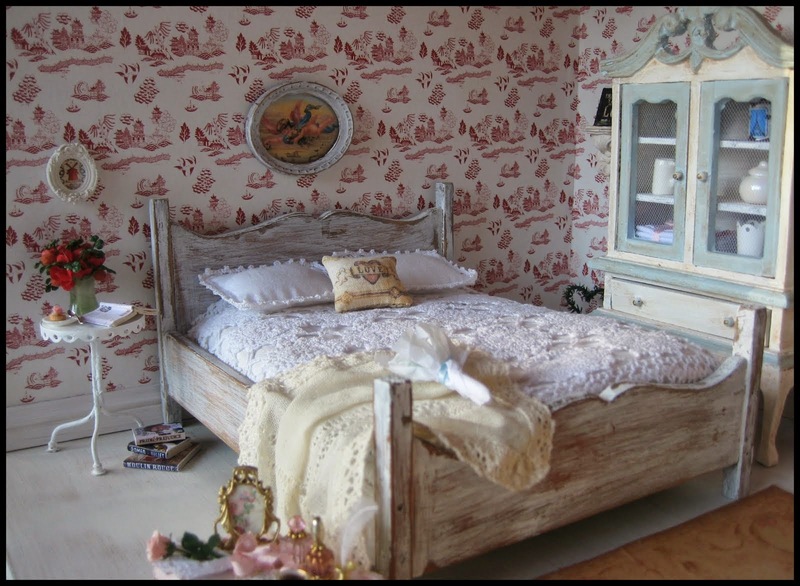 I just want to shrink down and get inside that 'shed', your interpretation of shabby chic is perfect to me. This is wonderful! 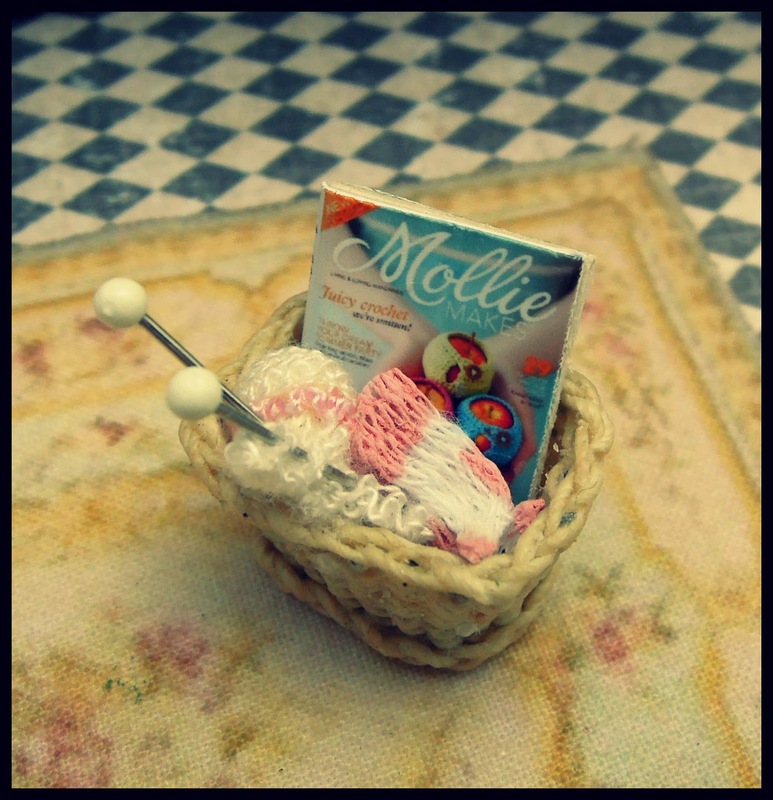 I happened upon your site through a pin and am amazed at your creativity and talent!